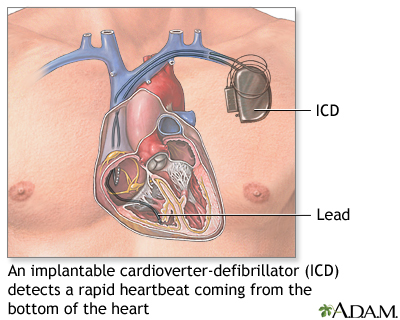 An implantable cardioverter-defibrillator (ICD) is a device that detects any life-threatening, rapid heartbeat. This abnormal heartbeat is called an arrhythmia. If it occurs, the ICD quickly sends an electrical shock to the heart. The shock changes the rhythm back to normal. This is called defibrillation. The pulse generator is about the size of a large pocket watch. It contains a battery and electrical circuits that read the electrical activity of your heart. The electrodes are wires, also called leads, that go through your veins to your heart. They connect your heart to the rest of the device. Your ICD may have 1, 2, or 3 electrodes. Most ICDs have a built-in pacemaker. Your heart may need pacing if it is beating too slowly or too fast, or if you have had a shock from the ICD. There is a special kind of ICD called a subcutaneous ICD. This device has a lead that is placed in the tissue to the left of the breastbone rather than in the heart. This type of ICD cannot also be a pacemaker. A cardiologist or surgeon most often will insert your ICD when you are awake. The area of your chest wall below your collarbone will be numbed with anesthesia, so you will not feel pain. The surgeon will make an incision (cut) through your skin and create space under your skin and muscle for the ICD generator. In most cases, this space is made near your left shoulder. The surgeon will place the electrode into a vein, then into your heart. This is done using a special x-ray to see inside your chest. Then the surgeon will connect the electrodes to the pulse generator and pacemaker. The procedure most often takes 2 to 3 hours. Some people with this condition will have a special device that combines a defibrillator and biventricular pacemaker placed. The pacemaker device helps the heart to beat in a more coordinated fashion. An ICD is placed in people who are at high risk of sudden cardiac death from an abnormal heart rhythm that is life threatening. These include ventricular tachycardia (VT) or ventricular fibrillation (VF). Ventricular tachycardia (VT) is a rapid heartbeat that starts in the lower chambers of the heart (ventricles). Ventricular fibrillation (VF) is a severely abnormal heart rhythm (arrhythmia) that is life threatening. You have had episodes of one of these abnormal heart rhythms. Your heart is weakened, too large, and does not pump blood very well. This may be from earlier heart attacks, heart failure, or cardiomyopathy (diseased heart muscle). You have a type of congenital (present at birth) heart problem or genetic health condition. An ICD sometimes delivers shocks to your heart when you DO NOT need them. Even though a shock lasts a very short time, you can feel it in most cases. This and other ICD problems can sometimes be prevented by changing how your ICD is programmed. It can also be set to sound an alert if there is a problem. The doctor who manages your ICD care can program your device. Always tell your health care provider what drugs you are taking, even drugs or herbs you bought without a prescription. Let your provider know about any cold, flu, fever, herpes breakout, or other illness you might have. Shower and shampoo well. You may be asked to wash your whole body below your neck with a special soap. You may also be asked to take an antibiotic, to guard against infection. You will usually be asked not to drink or eat anything after midnight the night before your surgery. This includes chewing gum and breath mints. Rinse your mouth with water if it feels dry, but be careful not to swallow. Take the drugs you have been told to take with just a small sip of water. You will be told when to arrive at the hospital. Most people who have an ICD implanted are able to go home from the hospital in 1 day. Most quickly return to their normal activity level. Full recovery takes about 4 to 6 weeks. Ask your provider how much you can use the arm on the side of your body where the ICD was placed. You may be advised not to lift anything heavier than 10 to 15 pounds (4.5 to 6.75 kilograms) and to avoid pushing, pulling, or twisting your arm for 2 to 3 weeks. You may also be told not to raise your arm above your shoulder for several weeks. When you leave the hospital, you will be given a card to keep in your wallet. This card lists the details of your ICD and has contact information for emergencies. You should always carry this wallet card with you. How much power is left in the batteries. Your ICD will constantly monitor your heartbeats to make sure they are steady. It will deliver a shock to the heart when it senses a life-threatening rhythm. Most of these devices can also work as a pacemaker. Epstein AE, DiMarco JP, Ellenbogen KA, et al. 2012 ACCF/AHA/HRS focused update incorporated into the ACCF/AHA/HRS 2008 guidelines for device-based therapy of cardiac rhythm abnormalities: a report of the American College of Cardiology Foundation/American Heart Association Task Force on practice guidelines and the Heart Rhythm Society. J Am Coll Cardiol. 2013;61(3):e6-e75. PMID: 23265327 www.ncbi.nlm.nih.gov/pubmed/23265327. Miller JM, Tomaselli GF, Zipes DP. Therapy for cardiac arrhythmias. In: Zipes DP, Libby P, Bonow RO, Mann DL, Tomaselli GF, Braunwald E, eds. Braunwald's Heart Disease: A Textbook of Cardiovascular Medicine. 11th ed. Philadelphia, PA: Elsevier Saunders; 2019:chap 36. Pfaff JA, Gerhardt RT. Assessment of implantable devices. In: Roberts JR, Custalow CB, Thomsen TW, eds. Roberts and Hedges' Clinical Procedures in Emergency Medicine and Acute Care. 7th ed. Philadelphia, PA: Elsevier; 2019:chap 13. Swerdlow CD, Wang PJ, Zipes DP. Pacemakers and implantable cardioverter-defibrillators. In: Zipes DP, Libby P, Bonow RO, Mann DL, Tomaselli GF, Braunwald E, eds. Braunwald's Heart Disease: A Textbook of Cardiovascular Medicine. 11th ed. Philadelphia, PA: Elsevier Saunders; 2019:chap 41. An implantable cardioverter-defibrillator (ICD) is a device designed to quickly detect a life-threatening, rapid heartbeat coming from the bottom chamber of the heart. It converts the abnormal rhythm back to normal by delivering an electrical shock to the heart.